St. John Murphy Alexander and Steamduck on the cover of "Her Majesty's Explorer." 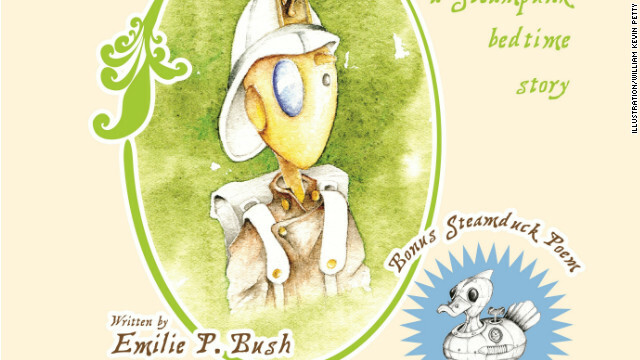 Author Emilie P. Bush isn’t shy about saying her latest book, “Her Majesty’s Explorer,” meant to get your little one's cogs and wheels turning, is the world’s first steampunk bedtime story. The illustrated children’s book, which released last Tuesday and jumped to No. 1 in Amazon’s “Hot New Releases,” follows the adventures of automaton St. John Murphy Alexander and his not-so-rubber ducky, Steamduck. Together, Bush and her illustrator, William Kevin Petty, have an original children’s book that caters to a specific subculture. But the charming concept wasn’t always easy. Petty is an Army officer and was stationed in Kuwait and Iraq during the process. He created some of his most whimsical illustrations for the book while witnessing horrors during his tour. CNN Geek Out caught up with Bush in a phone interview about the book and her experience working on it with Petty. The following is an edited transcript. Geek Out: Why did you want to write a steampunk bedtime story? Bush: I wanted to work with Kevin! Gosh, he has such talent. In relationships, the best ones are where each half thinks they got the better end of the deal, and that’s the kind of thing we have. We get on like a house on fire. Together, we have lots of plans. That’s why we did the bedtime story. He said, "Let’s work together, but I don’t know what we should do," and I went through his images and found one of the mechanical man. He had made some postcards, and he sent me one from Kuwait (Petty was stationed there as an Army captain), and I had this little postcard on the corner cupboard, and I looked at it all the time, and I just got so charmed by the guy. I wrote this story about him being an explorer and sent it to Kevin, and he sent me back some drawings. For a man who has no children, he understands kids really well. He knows how to make the face be appealing to a child’s eye. Geek Out: How did you meet Kevin in the first place? Bush: He sent me a message on Facebook! He had started drawing these pictures overseas, and like so many of us that come to steampunk, he showed them around and people said, "You draw steampunk," and he said, “What’s steampunk?” He went tooling around the Internet, discovering what steampunk was. He found my book and sent me some fan art of ["Chenda and the Airship] Brofman." I thought, "This guy has the talent of an artist and the discipline of a soldier, he gets the job done." He was halfway around the world, and we were well into the project and talking all the time on Facebook. By the time we finally met, we knew each other really well! It was a testament to his character that he could still be thinking about these really charming drawings while he was soaking in man’s inhumanity to man. He had some pretty rotten days in Iraq, yet he could still be thinking about these charming things. That’s one of the most remarkable things about Kevin. Geek Out: Tell me about Steamduck. Bush: Steamduck was one of the things he sent before going to Iraq. The interesting thing about children’s books is they’re meant for children to read, but adults pick them out and buy the books. The things that I liked best about books when I was a kid were the ones that I could go through myself, even when I couldn’t read, and have some activity with. Like Richard Scarry’s stories, where he has very detailed pictures and he would hide the Goldbug in many of his pictures. I would go and look for the Goldbugs and see if I could find them. When we went about creating the book, the first thing I did was I wrote the book in a circle because kids love to do things over and over again. The story of St. John Murphy Alexander starts with him marching for queen and country, coming home, following his duty and going to bed, without a fuss. And when he finally falls asleep, he dreams about exploring for the queen and country, so it takes you right back to the beginning of the story again. The other thing was, I said to Kevin, let’s put little things in the pictures so when we get to the end, we can have a little seek-and-find page. The idea is parents will read this to the kids, leave the book with them, and they’ll go back and look at the pictures again. Steamduck was the first of those. I loved Steamduck so much, I said, "We can market around Steamduck because he is adorable and kids get duckies." We started saying, "Looking for Steamduck? You will be." He appears in the bathtub with St. John, and Kevin wrote to me at one point and said, "You know, Steamduck has become such a big thing, you need to write another story just about Steamduck." Next, we’re going to do a story about Steamduck being a real duck that actually flies, because Steamduck is a swimmer that wants to fly. Geek Out: What do your kids think about it? Bush: They like the story, they ask me to read it all the time. They’re really excited that their daddy is going to school [Friday] to read the story. I sent the story to Captain Robert of [the steampunk band] Abney Park. Robert Brown took one look at this and said, ‘I’m reading this to my girls.’ He has a 6-year-old and 9-year-old. I was hoping for a blurb from the lead singer of the hottest steampunk band in the world. Not only did Captain Robert send me a blurb, which was, ‘I just read it to my daughters, and not only did they love it, now they want their own Steamduck. And by the way, I am happy to read the story for the video version.’ On the Web right now, there is a tease of him reading the opening of the story. The gravitas of his voice reading my words adds to the story tremendously. Beyond that, it’s a recording of Daddy reading the story for his kids. Everybody should have a recording of their daddy reading a story to them. I used to be suggested this website by means of my cousin. I am no longer positive whether this submit is written by him as no one else recognise such detailed approximately my difficulty. You're amazing! Thanks! i think he was great and he always says that no one is too oiadnrry to be hero and that we have to unleash the hero inside you. his presentation has showed the he didn't give up even people have been letting him down, and because he didn't give up, he was able to be cnn hero of the year and educate poor children in the philippines. Her Majesty's Explorer: a Steampunk bedtime story, is a picture book, geared toward 3- to 7-year olds. Font9a and Island Girl do bring up an interesting idea – what stories were read to you as small children that inspired your DREAMS of STEAM? (also – Dreams of Steam is a great series of anthologies from Kerlack Publishing). What picture books did you enjoy looking through by yourself as a kids that you still think on today? Great write-up! I got my copy of Her Majesty's Explorer and it is a perfect addition to steampunk literature. I've seen a lot written for young adults and adults, but nothing for the little ones. It's a sweet story and the illustrations are stunning. To Island Girl and font9a, I'd say that while the Verne and Wells were probably among the first stories read to children who later grew to embrace the steampunk way, this book may very well be the first bedtime story written specifically FOR steampunk-inspired children. Or, to put an even finer point on it, Verne and Wells were written for Victorian readers not Steampunk readers since "Steampunk" as a term or genre didn't exist yet, so while their stories certainly appeal to and inspire modern steampunks, this is a bedtime story specifically for steampunks and written with a clear understanding of the modern steampunk community and culture. This is not the world's first Steampunk Bedtime Story! Font9a is right: 20,000 Leagues Under the Sea was... But good luck in your story writing career, Emilie.